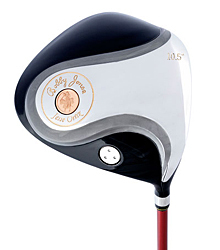 New for 2008 is the Bobby Jones Workshop Edition Driver by Jesse Ortiz. If you have the one of the hugely popular Bobby Jones Hybrids, then the driver will be an ideal match. It has a similar head shape, a high MOI with the triangle of stability design. Available in 3 lofts, and fitted with an Aldila DVS shaft, the Bobby Jones Workshop Driver will help you find the fairway more often. Check out the promotional video we have posted. Any fan of Jesse Ortiz golf clubs will want to put this driver in their bag. We’re being told production is going to be limited, so don’t wait, or they’ll be gone.